The countdown is on. 26 weeks have passed – 26 weeks to go in the year 2017. Don’t get me wrong, I am not rushing the summer. On the contrary, I intend to enjoy every minute. How do you enjoy the moments of your life? Are you aware of what you are doing and what’s going on around you? It’s challenging sometimes, isn’t it? Time flies when your having fun, so they say. And before you know it, the moment has passed. My clients realize this in our coaching sessions. They think back to what they ate a day or two ago, and one might say, “Oh! I just realized, I never ate lunch. I was busy in meetings and kept thinking I would order in, but now that I think about it, I never did.” Another might say, “Well, there were sandwiches in the conference room and I ate one.” In the moment, neither was aware of what they were doing. One client skipped a meal without even realizing it. The other ate lunch but couldn’t tell me what she ate; lunch was whatever was available. Both actions are very common for emotional eaters: skipping meals and then finding yourself very hungry, perhaps with a headache and eventually grabbing fast food; or, mindless eating that doesn’t really satisfy you which leads to snacking on candy and carbs (cookies! cake! pretzels!). 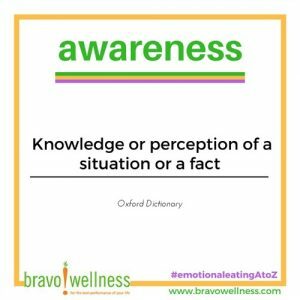 AWARENESS is key for emotional eaters. Or are you eating what’s available, without paying attention? Are you aware of how you eat? Or are you just doing what you need to do to get food in your body? Are you aware of when you eat? Or are you eating because you are bored or lonely or anxious or procrastinating? Take the first step toward freedom from emotional eating and become aware of your emotions and your actions. Don’t get overwhelmed. Change isn’t going to happen overnight. Taking one step at a time is key; and, of course, taking the first step is crucial. Take time to practice awareness – notice how you eat, when you eat and what you eat. Please, please, please – don’t judge any of your actions and observations. Nothing is “bad” or “good” – you just want to have an awareness of your habits. 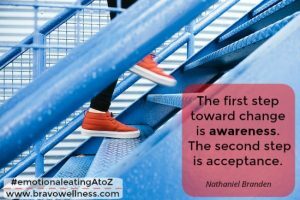 Developing this awareness is the first step toward your freedom from emotional eating. It’s a big step and I’m here by your side.